An example of a typical green funeral would be where the body is prepared without embalming, dressed in simple biodegradable clothing without jewellery, and placed in a shroud or biodegradable coffin. In Australia it is not yet permitted to bury without any outer covering. The body is then buried in a specially designated green cemetery or bushland area where, rather than marking the grave with a large marble headstone, there is either no headstone or a natural marker (such as an engraved stone, tree or flowers). Sometimes the only marker will be satellite navigation coordinates. Finally, instead of requiring the body to be buried 6 feet under (which requires heavy earthmoving equipment) green graves are dug at a depth of around 3 feet. For many Australians, having a green funeral is appealing as it’s a way to leave the world with minimal impact to the environment. It’s a trend that’s growing in popularity as shown by the increasing number of green burial sites across Australia. Globally, the UK has also increased it’s green burial sites from just one fifteen years ago to over 270 today, and a US study by the Funeral and Memorial Information Council found that 64% of people aged 40+ expressed an interest in green burials – a 21% increase from a similar survey they conducted in 2010. Many people view a green burial as a more natural way to be memorialised, with roots stretching back to a time before the commercialisation and industrialisation of the funeral industry. However, by far the main reason people choose a green funeral is that it’s significantly more environmentally friendly and sustainable compared to a traditional funeral. How Much Better is a Green Funeral for the Environment? Considering the environmental impacts of a traditional funeral listed above, you might think that cremation is a more environmentally friendly option. However, the cremation process, which involves burning a body at temperatures between 760 – 1,150 degrees Celcius for 75 minutes, uses an incredible amount of energy. That’s roughly the equivalent of all the energy needs of a single person for an entire month. A study in the UK has estimated that cremation is also responsible for approximately 16% of the mercury pollution in the air. In order to be buried in a green cemetery or natural burial site, you’ll be required to use a green coffin. A green coffin is a coffin that is made from natural (often recycled) materials that are safely biodegradable, and built in a way that is non-toxic and sustainable to the environment. Whereas traditional coffins may take decades to decompose, with metal parts and fittings and veneers which seep into the soil, green coffins are designed to decompose much faster and without an impact to the surrounding area. 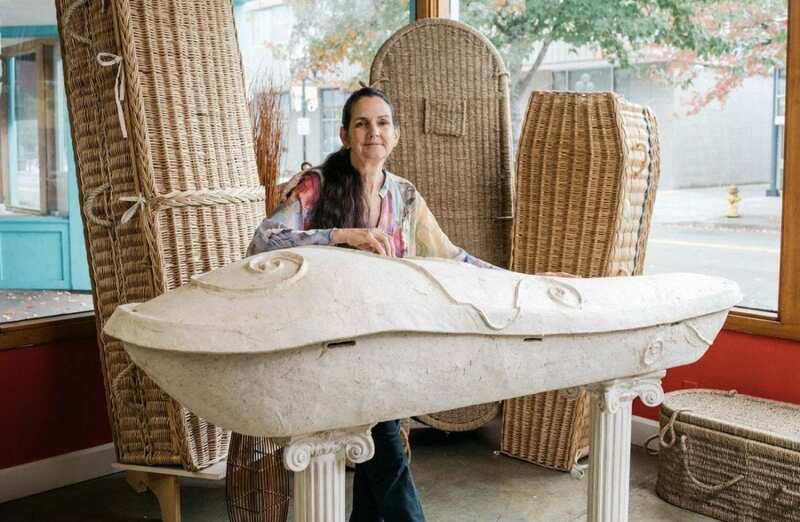 Most natural burial sites will allow the use of burial shrouds rather than coffins. However, the use of shrouds in traditional cemeteries differs from state to state, and may be dependent on your religion. For example, Muslims are granted an exception in most states for burial in a shroud without a coffin. If you would like to be buried in a shroud, you should consult your funeral director. Not yet available in Australia, this product created in the US last year when it went on sale. Yes, it was none other than the famous flesh-eating mushroom death suit. On sale for US$999, the product is designed to grow mushrooms that will naturally decompose your body while removing any environmental contaminants in your system, such as heavy metals and preservatives. While we don’t think it’s likely to become mainstream in Australia any time soon, it has helped to spark more important conversations about green funeral options. 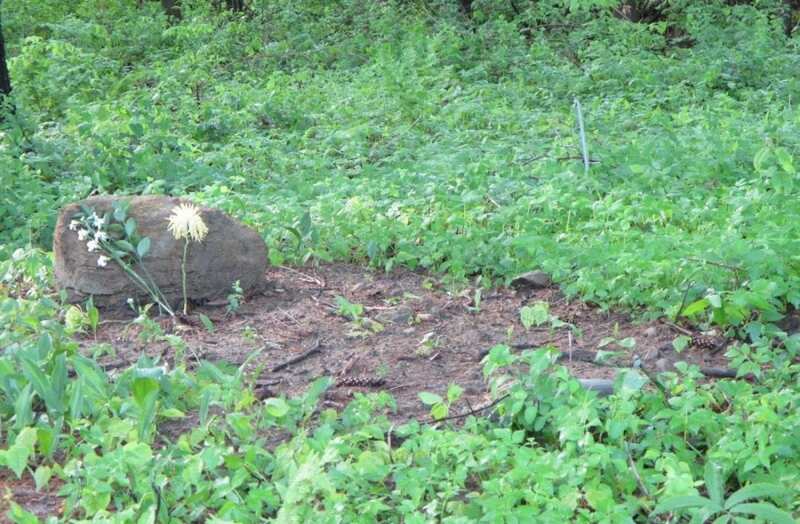 Graves at natural burial sites are sometimes unmarked (with only satellite coordinates to guide families) or marked with a green headstones. 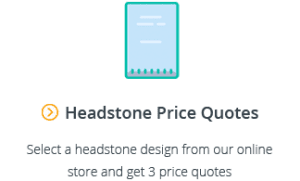 A green headstone is different from a traditional headstone as it’s an unprocessed, naturally occurring element – such as a rock, stone, tree, or flower. They are unobtrusive and blend into the environment, although rocks and stones can sometimes be engraved. The cost of a green funeral sits in between the cost of a typical cremation and the cost of a traditional burial. Generally speaking, a green funeral requires all of the same components as a traditional burial except the grave plot is cheaper, there’s no requirement for grave liner or burial vault, and you don’t need a headstone. If you opt for a burial shroud, you can also save on the cost of a coffin. Together, these items can easily add up to thousands of dollars in savings. 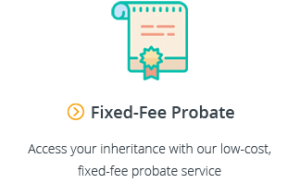 For more information on funeral costs generally, see our Guide to Understanding Funeral Costs in Australia. Many funeral directors in Australia will be able to offer your green funeral services and products. 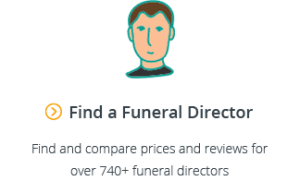 The easiest way to find a funeral director is by using our website which lets you instantly compare funeral director prices and reviews. 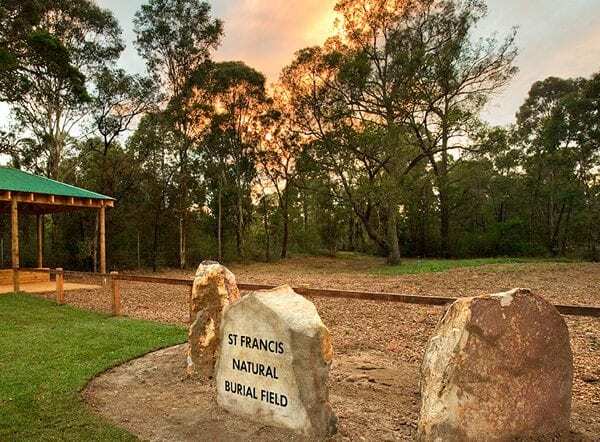 The first natural burial ground in Australia opened in 2008 at Lismore, and since then they have continued to grow in number around the country. 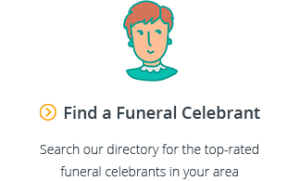 Offering a more natural (and less commercialised) farewell, at a cheaper price, in a way that has less impact on the environment and leaves a positive legacy, it’s not hard to see why green funerals are continuing to grow in popularity around Australia. Would you consider a green funeral? Let us know what you think in the comments section below. I’d love to find a natural burial ground that plants a tree and becomes a forest on the North Shore of Sydney. Some where my kids can go to visit and find peace. I wish we could have a natural burial ground here in the mid-north of South Australia with its peace and tranquillity. I have run the idea past friends and their reactions were all positive.